What are the different international student recruitment services? All schools or universities have one or several people to deal with international student recruitment. Whether the institution uses international partnerships to run exchanges or attracting freemovers, there is always somebody in charge of connecting students with programs, but also housing, credit transfer, health insurance, accommodation, planning… And to make the link with internal marketing to generate information requests. Some institutions ask local representatives to promote their programs to students. These agents provide information about the university, give details about available scholarships, prepare the students for international immersion and train them for interviews and language adoption. Agents take care of all the admission and visa paperwork. Agents are paid by the destination university, between 15-30% of the tuition fees. Becoming visible on a global scale requires advertising and making information about programs available. Specialized companies like HigherEdMe build advertising campaigns on social networks, insert articles and ads in magazines, newspapers, manage email flows. Some of them list all programs available in the world with search engines, and ask universities to pay to be listed or to be contacted. Schools and Universities also participate in local fairs to meet students. This can be a series of face-to-face meetings between students and recruiters or this can simply be a booth displaying all programs from a university with a local alumni who explains his/her past experience. These fairs come to an expense that ranges from 3 to 6k€ per standard booth, to which you must add time, travel and accommodation expenses. That is why some institutions and service providers have started using virtual fairs and seminars. Getting qualified leads is the promise of directories and marketplaces. 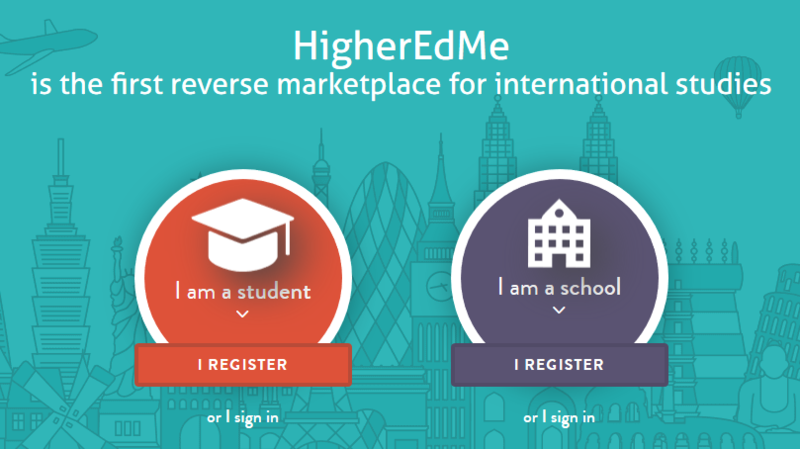 At HigherEdMe, we think answering a student question and helping him/her shape a study abroad project is better. We like to say that we are a reverse marketplace, because institutions are making the first move based on the student wish. The cost of our platform for a year is lower than one educational fair, and can start several hundreds of conversation, anywhere in the world.